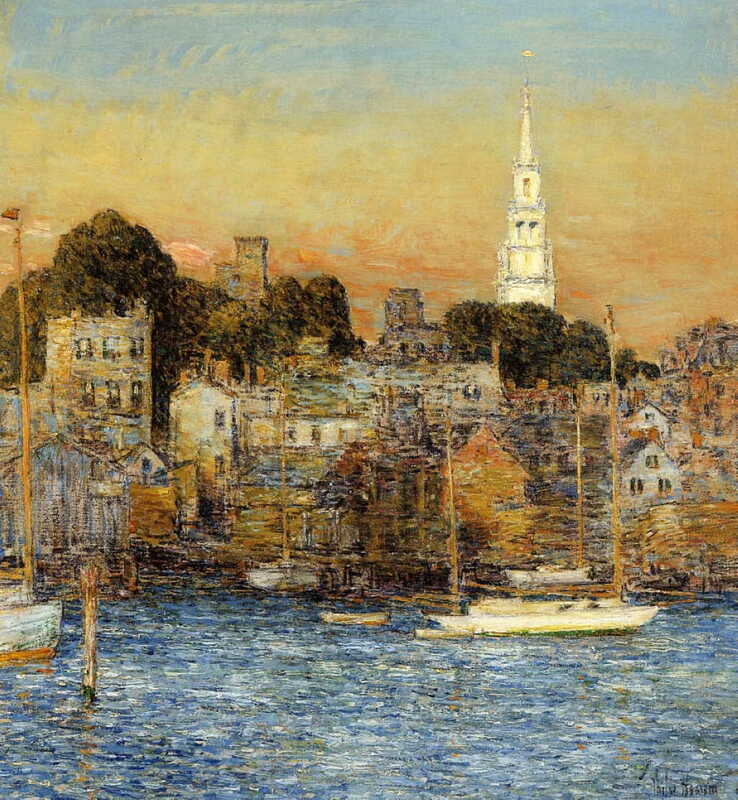 Frederick Childe Hassam, October Sundown, Newport (1901), oil on canvas, 67.2 x 61.8 cm, Private collection. WikiArt. Note: his surname is British, not Arabic, in origin, and he placed the stress on the first syllable, HASSəm. He was known to all though as Childe, pronounced as in child. Born in Dorchester, Boston, MA, in 1859, he studied the craft of wood engraving after working briefly in a publisher’s accounts department. Apprenticed to a wood engraver, he became known for his drawing skills. He also started painting, mainly in watercolour but from around 1880 in oils too. He set up as a freelance illustrator in 1881, working for Harper’s Weekly and other magazines, mainly illustrating children’s stories. He took classes at the Lowell Institute (part of MIT), and at the Boston Art Club. With his friend Edmund H Garrett, he toured the UK, the Netherlands, France, Italy, Switzerland and Spain in the summer of 1883. In addition to studying Masters, he painted detailed realist watercolours, which he exhibited in 1884. He was particularly impressed by the watercolours of JMW Turner during that trip. 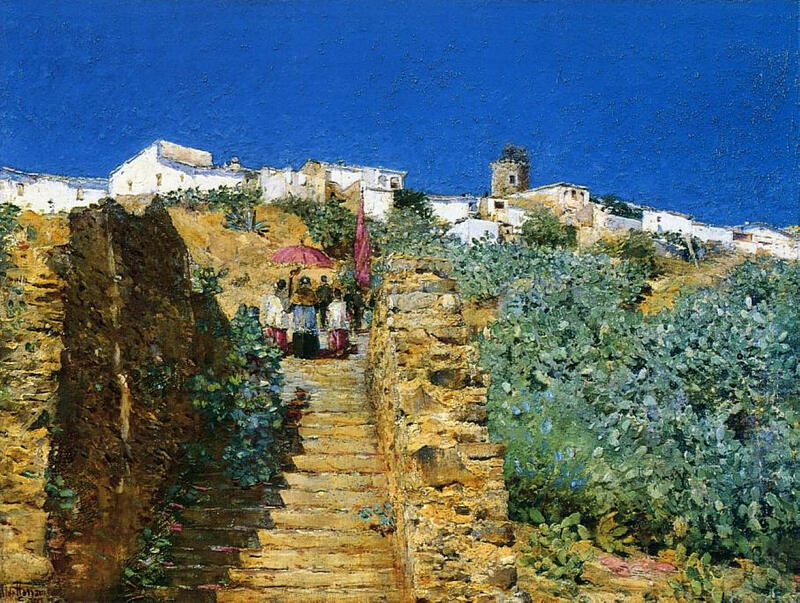 Frederick Childe Hassam, Church Procession, Spanish Steps (c 1883), oil on canvas, dimensions not known, Private collection. WikiArt. He started teaching at the Cowles Art School, and became influenced by William Morris Hunt, who in turn had been influenced by the Barbizon School. Thus he placed emphasis on atmosphere and light, and working plein air. He started to paint more urban scenes, although these were not always well received by critics. 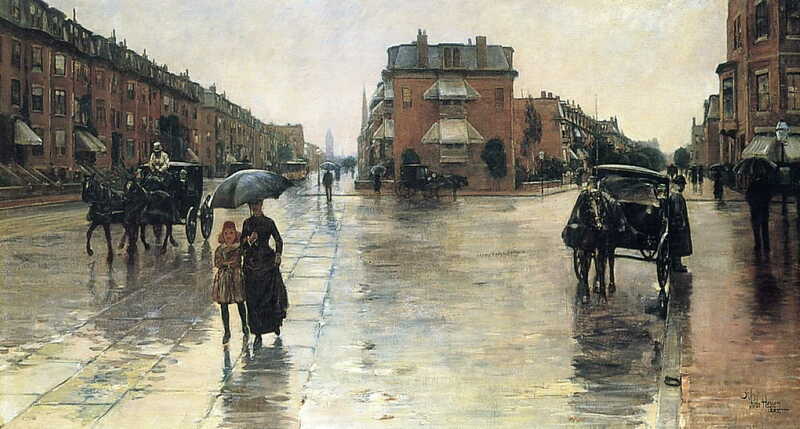 Frederick Childe Hassam, Rainy Day, Columbus Avenue, Boston (1885), oil on canvas, 66.4 x 121.9 cm, Toledo Museum of Art, Toledo, OH. WikiArt. Throughout the early part of his career, some of his paintings appeared to borrow from those (now more famous) of the French Impressionists. For example, Rainy Day, Columbus Avenue, Boston (1885) has an uncanny resemblance to Gustave Caillebotte’s Paris, a Rainy Day (1877). 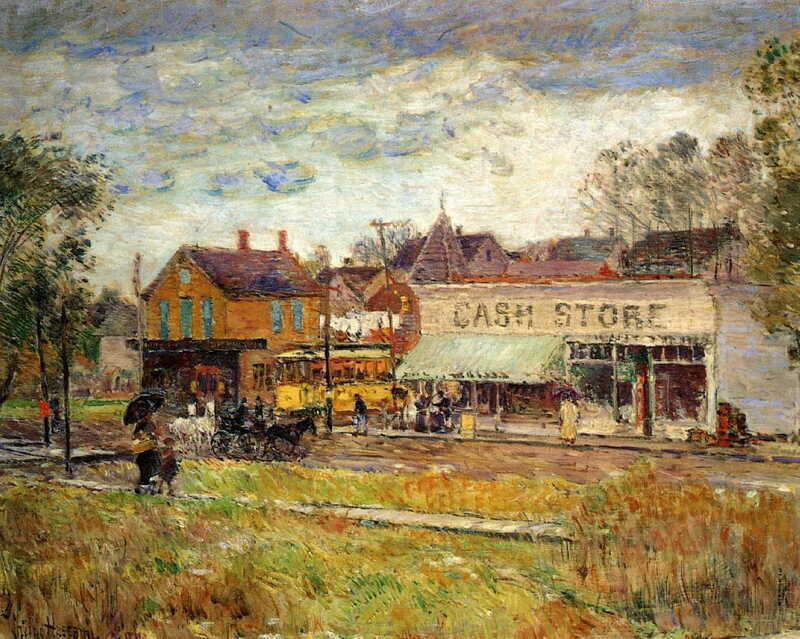 However it is unclear whether Hassam had seen the latter painting at the time, or this was mere coincidence. Frederick Childe Hassam, A City Fairyland (1886), oil on canvas, 50.8 x 83.8 cm, Private collection. WikiArt. He moved to Paris in 1886, where he enrolled in the Académie Julian and studied under Boulanger and Lefebvre. In the autumn of 1887 he experimented with a change of palette, which brought about a shift to Impressionist style, with more painterly brushstrokes too. 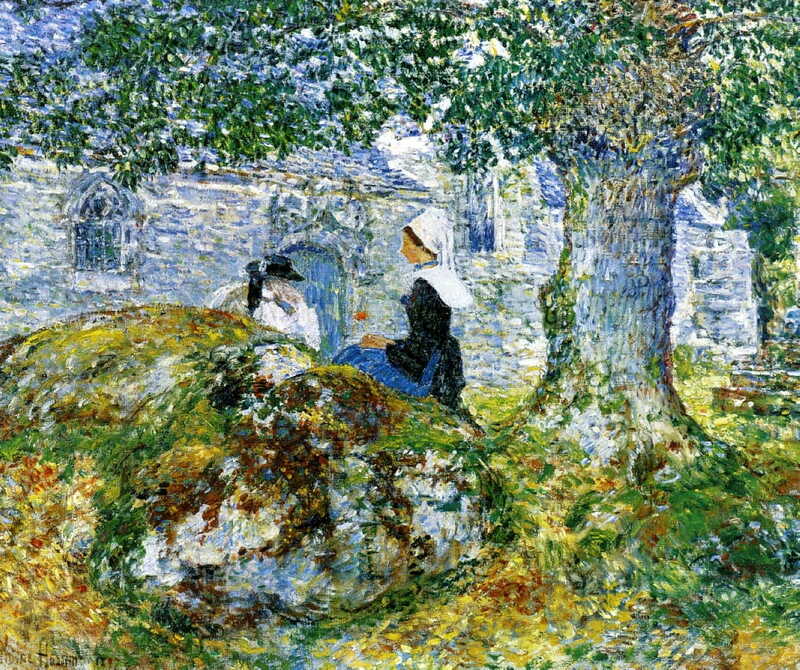 Frederick Childe Hassam, In Brittany (1887), oil on canvas, 60.3 x 71.4 cm, Private collection. WikiArt. He had four paintings exhibited at the Universal Exposition in Paris in 1889, and won a bronze medal as a result, although three successive acceptances for the Paris Salon went unrewarded. However, while he was happy to praise the French Impressionists such as Monet, Sisley, and Pissarro, he considered that they were “extreme”, had little or no contact with them when he was in Paris beyond taking over Renoir’s old studio, and he worked independently. He visited London and the south of England during the summer, and returned to the US in 1889, moving to New York, where he resumed painting mainly urban landscapes but in his new, loose impressionist style. 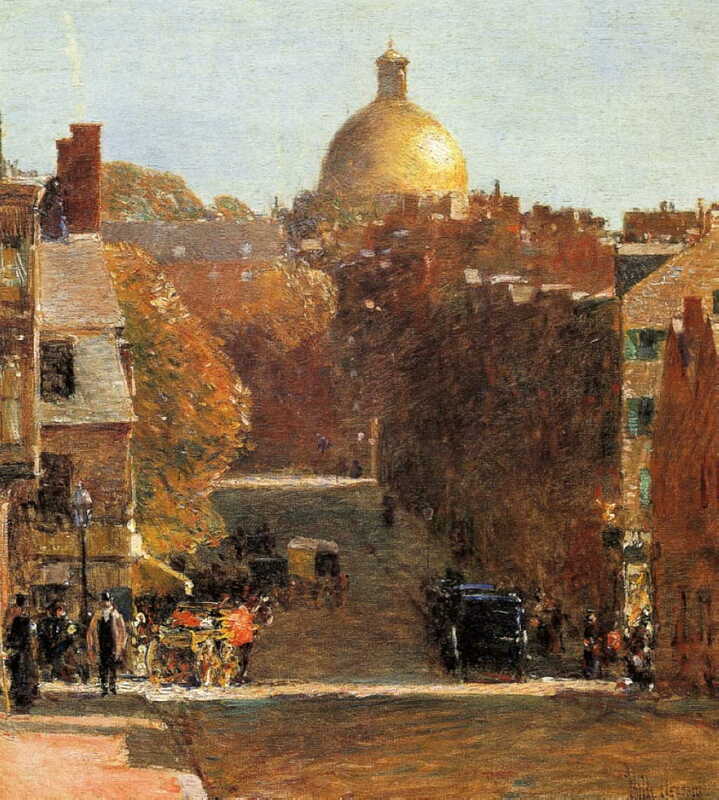 Frederick Childe Hassam, Mount Vernon Street, Boston, Looking Towards the State House (c 1890), oil on canvas, 45.7 x 40.6 cm, Private collection. WikiArt. 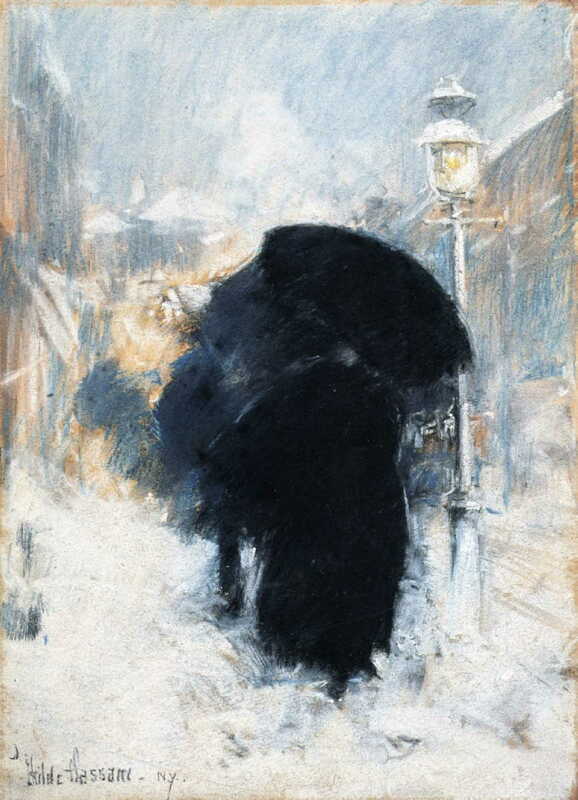 Frederick Childe Hassam, A New York Blizzard (c 1890), pastel on grey paper, 34.9 x 24.1 cm, Isabella Stewart Gardner Museum, Boston, MA. WikiArt. 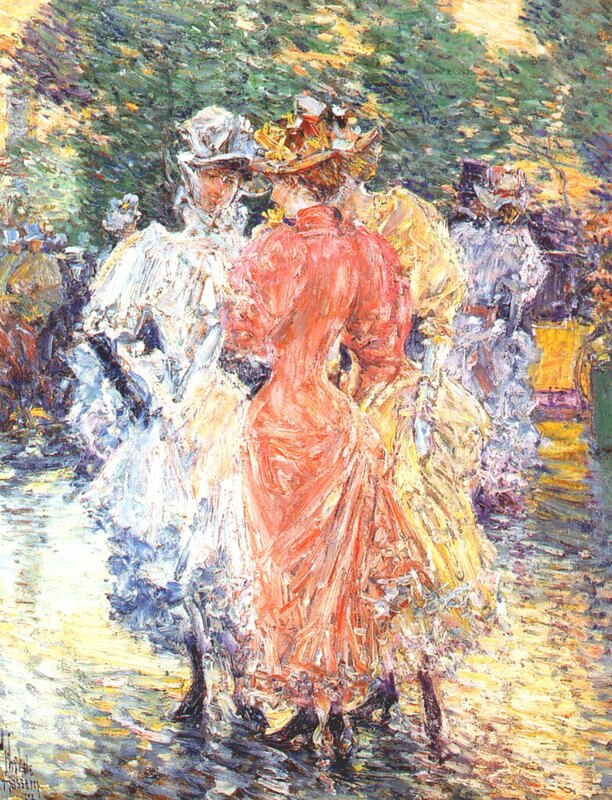 Frederick Childe Hassam, Conversation on the Avenue (1892), oil on board, 40 x 31.8 cm, Private collection. WikiArt. 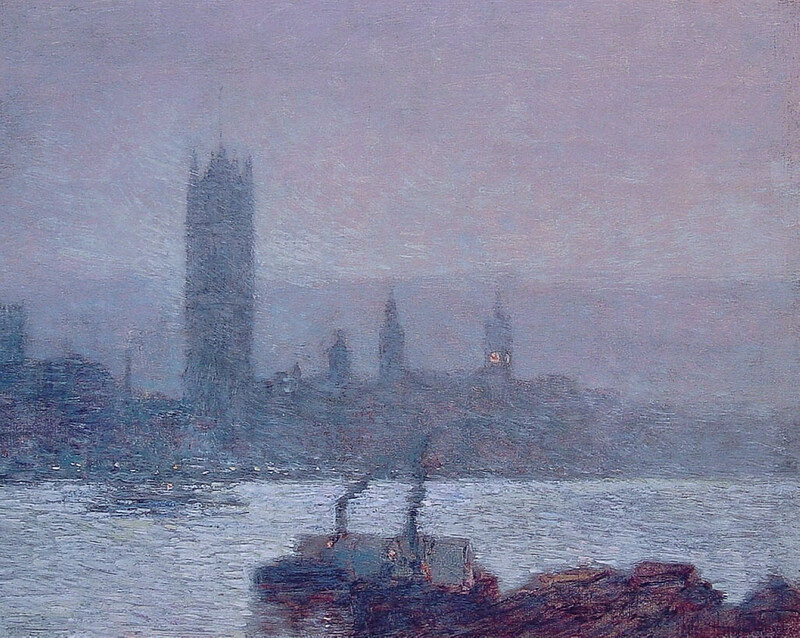 During the 1890s he showed the influence of post-impressionism and sometimes even early Fauvism, but continued in his uniquely impressionist style. He became close friends with J Alden Weir, John Henry Twachtman, and Theodore Robinson. These four American Impressionists maintained contact with Monet. He spent summers painting plein air in locations such as the artists’ colony on Appledore Island, in the Isle of Shoals, New Hampshire. He also visited Gloucester, MA, and coastal parts of Connecticut. He visited Cuba in 1895, and in the following year had a one-man retrospective exhibition at the American Art Galleries, New York, with over 200 of his works. However prices realised were so low that it was considered a financial disaster, and in December he travelled to Naple, Rome, and Florence, arriving in Paris in the Spring of 1897. He visited the south of England again, and returned to the US in October. 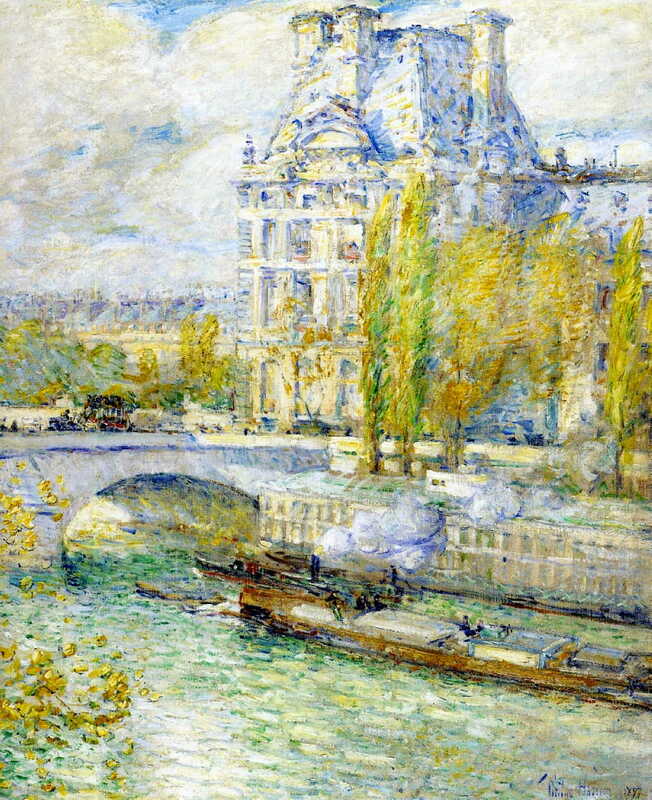 Frederick Childe Hassam, Le Louvre et le Pont Royal (1897), oil on canvas, 72.4 x 62.2 cm, MSC Forsyth Center Galleries, Texas A and M University, College Station, TX. WikiArt. At the end of 1897, he took part in the secession of Impressionists from the Society of American Artists, forming The Ten, of which he was a leading member. His works were increasingly dismissed by critics as being “quite incomprehensible”. 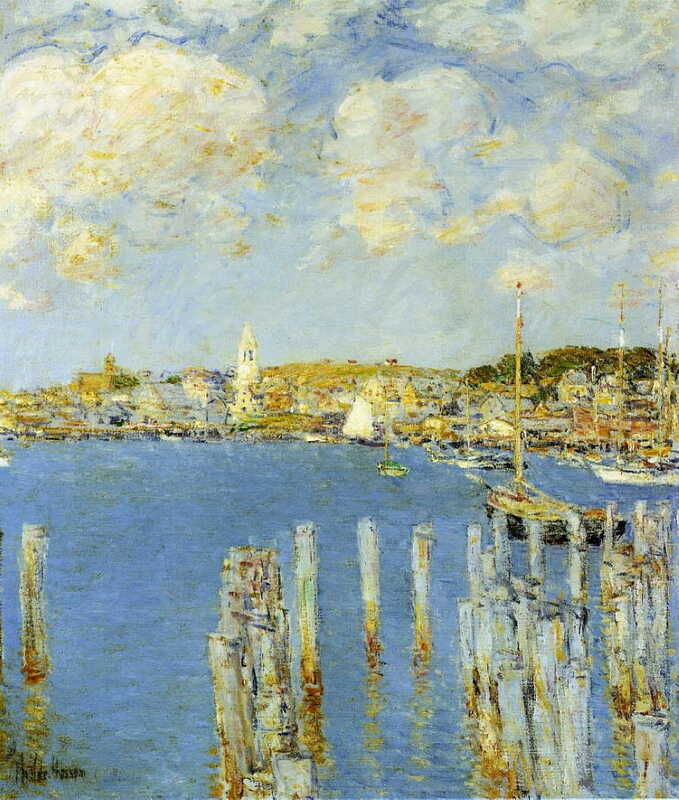 Frederick Childe Hassam, Gloucester Inner Harbor (c 1899), oil on canvas, 61 x 50.8 cm, Dumbarton Oaks Research Library and Collection, Washington, DC. WikiArt. Adverse criticism gradually settled, and by 1900 his work was selling steadily and becoming more accepted. However he became depressed and showed signs of a significant alcohol problem. 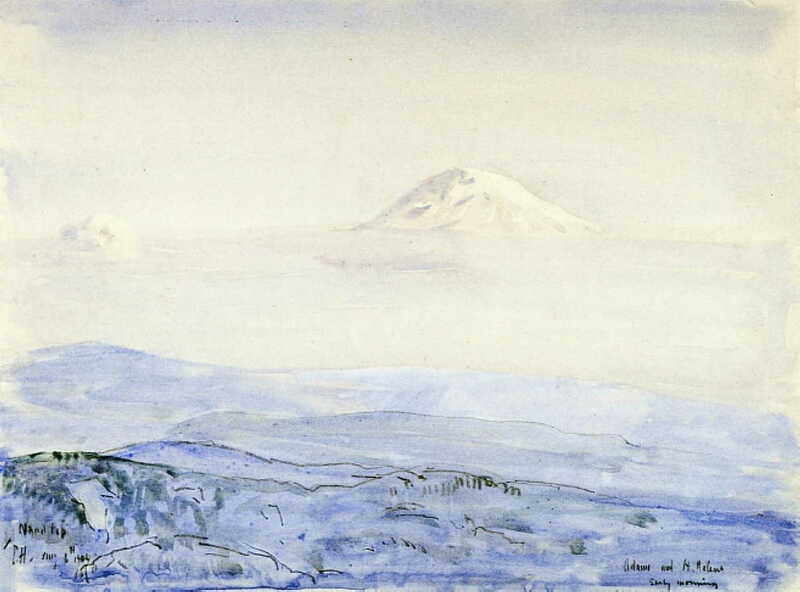 Visits to Oregon brought further experimentation, and he even painted some nudes in idealised landscapes which appear to have been influenced by Symbolism and Pierre Puvis de Chavannes. 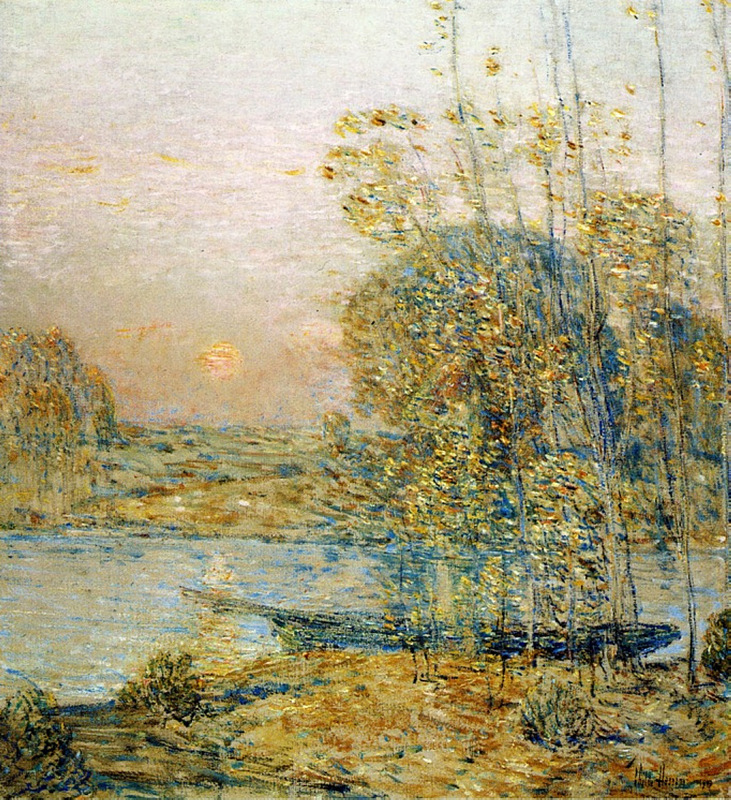 Frederick Childe Hassam, Late Afternoon (Sunset) (1903), oil on canvas, 57.2 x 50.8 cm, Florence Griswold Museum, Old Lyme, CT. WikiArt. Frederick Childe Hassam, Adams and St. Helen’s, Early Morning (1904), watercolour, 25.4 x 35.2 cm, Fogg Museum of Art, Harvard University, Cambridge, MA. WikiArt. 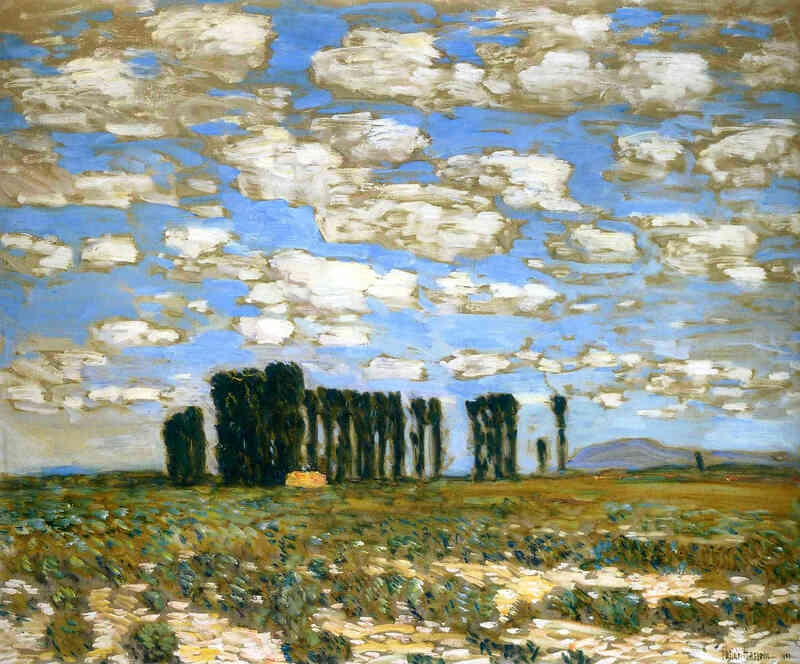 Frederick Childe Hassam, Harney Desert Landscape (1904), oil on canvas, 63.5 x 76.2 cm, Private collection. WikiArt. 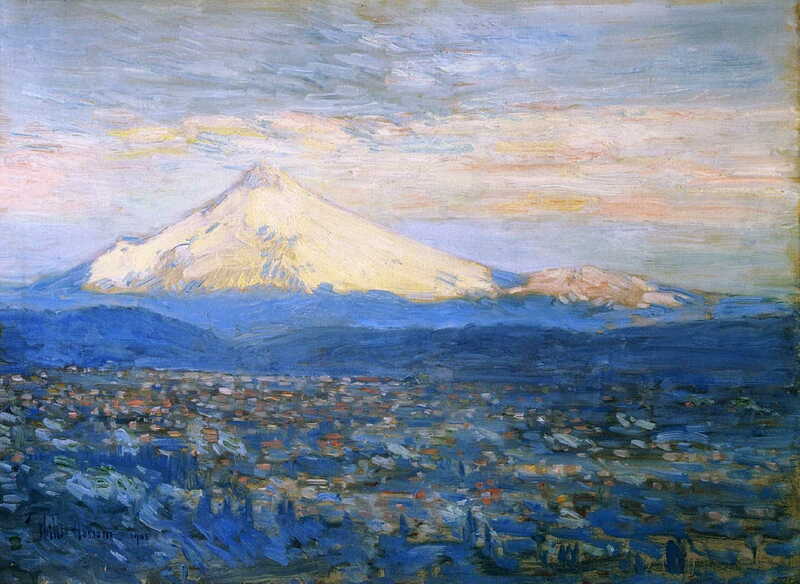 Frederick Childe Hassam, Mount Hood (1908), oil on canvas, 45.7 x 63.5 cm, Portland Art Museum, Portland, OR. WikiArt. He visited Europe again in 1910, travelling to the Netherlands, France, and Spain, but was disappointed by the great change he found in Paris. 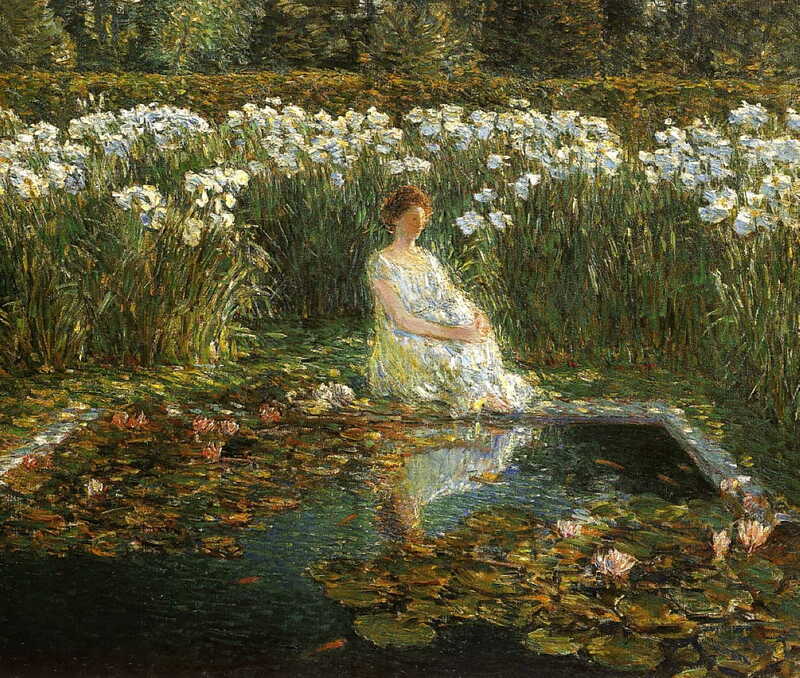 Frederick Childe Hassam, Lilies (1910), oil on canvas, 69.2 x 83.8 cm, Private collection. WikiArt. He visited Paris again in the early summer of 1911. After 1912 he turned increasingly to print-making, and watercolours. 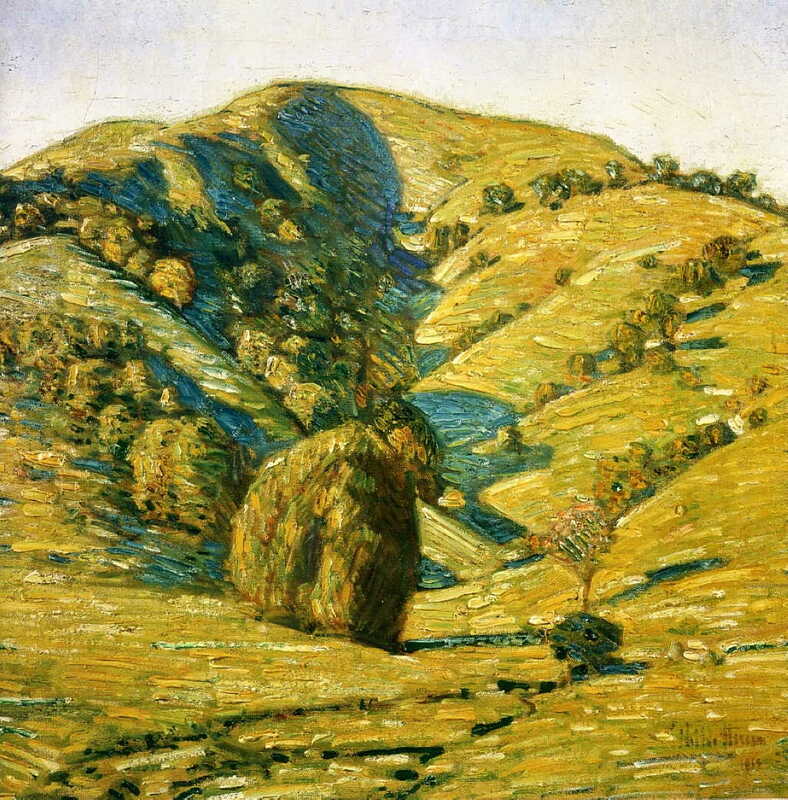 Frederick Childe Hassam, Hill of the Sun, San Anselmo, California (1914), oil on canvas, 24.1 x 24.1 cm, Oakland Museum of California, Oakland, CA. WikiArt. In 1916, he started a series of paintings of flag parades, “Preparedness Parades”, as part of the war relief effort. He completed the series in 1919. 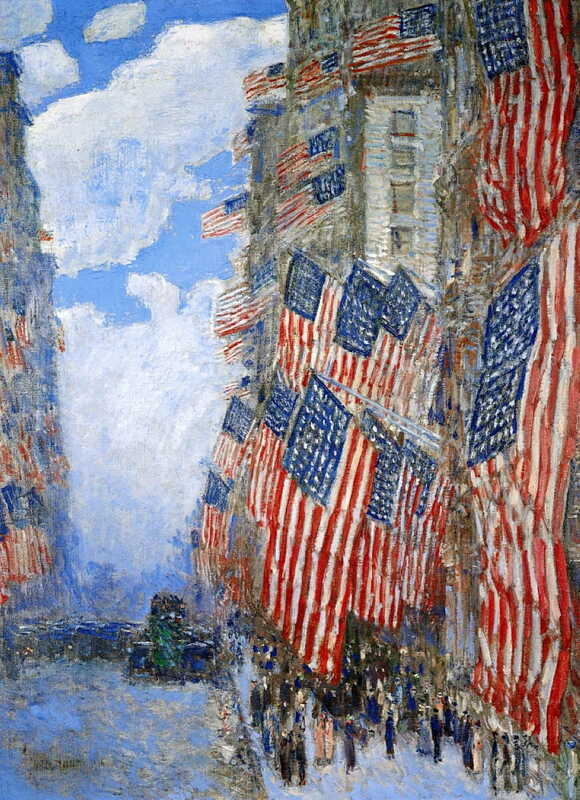 Frederick Childe Hassam, The Fourth of July, 1916 (1916), oil on canvas, 91.4 x 66.4 cm, Private collection. WikiArt. He spent more time in his new home in East Hampton, New York City, from 1919. In 1920 he was awarded the Gold Medal of Honour by the Pennsylvania Academy of Fine Arts, and had further awards later that decade. He became openly critical of modernist trends, including Cubism and Surrealism. 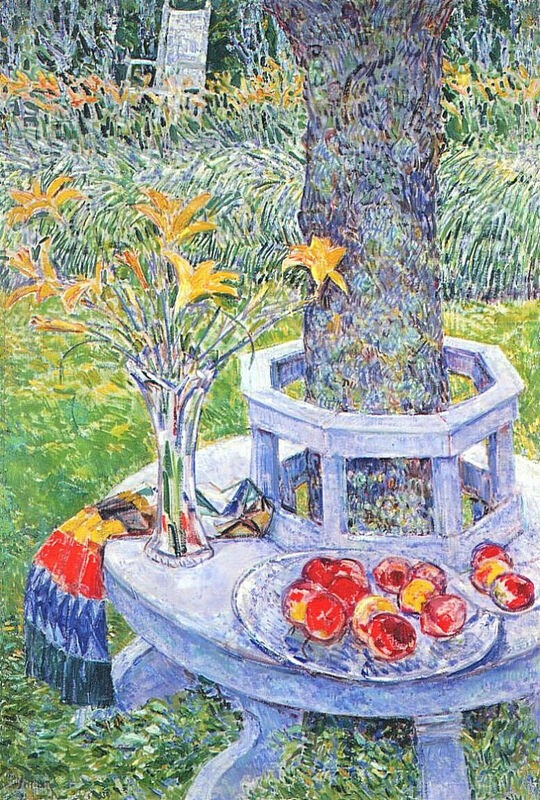 Frederick Childe Hassam, Mrs Hassam’s Garden at East Hampton (1934), oil on canvas, 103.5 x 72.4 cm, Private collection. WikiArt. He died at his home in East Hampton in 1935. However his work was already in eclipse, and it was not until its revival in the 1960s that he received much posthumous recognition. 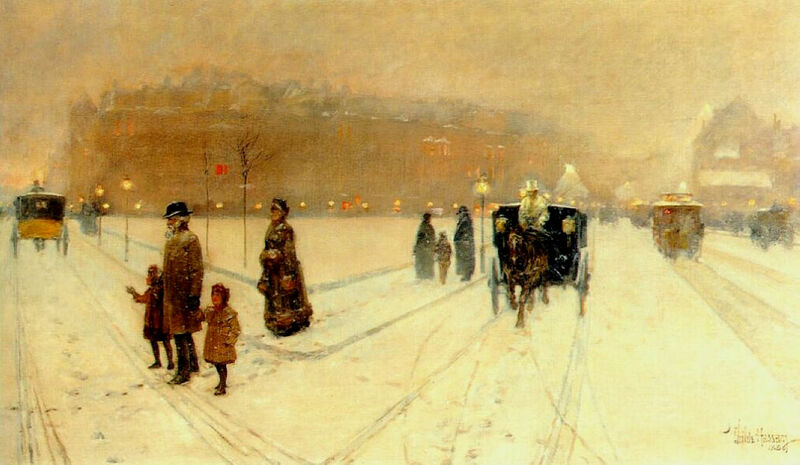 Childe Hassam is often claimed to be the greatest of the American Impressionists, and with several thousand paintings to his name he was certainly among the most prolific. After a brief initial period of realism, he was as intensely Impressionist in his style as any of the French Impressionists, and in the twentieth century developed unique responses to the modernist trend. He clung to Impressionism to the end, and as a result is one of the leading American Impressionists. Posted in Painting and tagged Barbizon, Caillebotte, flag, Hassam, Impressionism, Monet, painting, Robinson, The Ten, Turner, Twachtman, USA, Weir. Bookmark the permalink.